Everyone in positive training has heard it: When you know better, do better. But that "know better" is going to look a little different for everyone. Sometimes, we need to hear the same message said multiple ways from different people before it truly sinks in. At FDSA we give out a lot of training advice. And if i say so, most of it is pretty dang good. But some moments stand out as better than good. 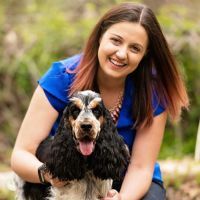 For today's blog post, we turned to our students to find some of those gems — the moments that stood out to them as major "aha" moments, the things that changed their perspective, shifted their training, and helped them become "better" when training their dogs. "Train for emotional state, not just the behavior." The first time I saw the URL for Chrissi Shranz's old training page (clickforjoy.wordpress.com), I thought it was a nice sentiment, but a misleading one. Why would I want to click for something as ambiguous as joy? I would end up rewarding a flailing, leaping, ridiculous mess, and not the precise behaviors that I'd been taught to use the clicker for. But after a lot of work on engagement and play (thanks Denise! ), and confidence building games (thanks Julie's and Sarah! ), I found myself doing exactly that: Rewarding joyful effort. Chrissi has since moved onto a new website, but I still think fondly of the phrase "click for joy." My dogs and I are much happier learners for it. "Pocket hand: Keep your hand still and in the correct position, and your dog will almost magically move into heel position." I was lucky enough to have a working spot in Denise's Precision Heeling Working Webinar (now called a Workshop). I had been struggling with pocket hand, and couldn't figure out why it didn't seem to be working for me, when all of a sudden, Denise said something that made it just click: hold your hand still and in the proper position, and your dog will HAVE to move their rear in, and wind up where they belong to get the cookie. Light bulb moment. "I'll have other dogs, but my dog only has one life. It's up to me to give him the best life I can, focus on what he actually enjoys, not what I want him to enjoy or think he should enjoy." I learned this lesson collectively from the community of students and instructors at FDSA, I saw others constantly talking about how they adapted their training and expectations based on their dogs' needs and abilities. People talking about how they completely dropped or switched sports because their dog didn't enjoy the one they had picked out, sometimes after months of training and monetary investment, really made this click for me. I don't currently do dog sports, I'm a pet owner with a very fearful dog, and this lesson was so important for me to learn. It switched my mindset from, "if you weren't so afraid we could do this thing I want to do," to, "what can we do today that we'll both enjoy?" Since thinking more about what makes him happy, and less about what he should like to do or what I thought having a dog would be like, our relationship has been exponentially better and its greatly increased his confidence. "When in doubt, JUST THROW FOOD!​"
"When in doubt, JUST THROW FOOD!". . . I heard this phrase from two different FDSA instructors. Hannah Branigan said it at a seminar I attended when she was talking about what to do when a training session starts going south. She said to avoid digging an even bigger hole, throw food and end the session. Take a break, review video, and make a new training plan for the next session. Sarah Stremming gave the same advice in 'Hidden Potential' when talking about how to handle a soft/sensitive dog who can shut down in shaping or defaults to stillness. "Just throw food" to get them moving, and then click anything to get the session re-started. "It's about the HABIT of attention. Thank you Deb and Judy. And that led me to teaching the performance behaviors to habit level, not just to 'well, he knows what he should be doing. '​​"
I had my terrier puppy in Deb and Judy's focus class, and it was winter in Alberta. I'm not sure it was the 'Right Time' for us, but somewhere in there, while I was questioning where it was all going, I realized they were trying to get the dog to have the HABIT of focus and attention. No begging, no being more interesting than dirt, just teaching that Habit. And then the light went on that I want to teach ALL my performance behaviors to the Habit level, well past "well, he should know what I want." So important. Thanks, Deb and Judy! "Make a plan; execute the plan...if it doesn't work like you expected, stop and think and make a new plan. And video is your BEST friend!​"
Dog training for me was a "seat of the pants" kind of thing. I took Amy Cook's The Science of Training: Think, Plan, Do and it changed the way I look at breaking down behaviors. Taking the time to stop after a session and work out a new plan based on observation may take a bit longer at the time, but it definitely speeds up training. Taking Fenzi classes also showed me the value of video taping my training sessions. Being able to see myself in action has helped me tremendously. It is much easier to see what happened on video than it is in the moment. "The dog will tell you they can't. You have to listen and fix something on your end​." Your dog will tell you they can't. They are not ignoring you, they simply can't process what you are asking them. As your dog's teammate, It's up to you to listen and fix something on your end to help your dog succeed. FDSA has given me many tools to be a better teammate for my dog! "My dog was wanting to look around the ring because I wasn't giving him the chance to check stuff out enough before he went in.​"
It was in the ring confidence for rally and ob course. I'm self taught in rally and ob due to my work schedule not lining up with class schedules. Because of this I'm able to figure out most of the actual exercises, but miss out on how to fix issues we face at the trial itself. My dog was showing signs of ring stress and I started to realize how common ring stress is, so I looked to FDSA for a solution. I was going straight from crate to warm up to ring without any real acclimation time. My dog listened well but would be looking around and he often did better in the afternoon trial, the 2nd trial. Learning the idea of "squish" and letting him comfortably check out the ring before is just such a basic thing, but something I was overlooking. And it was "huh, of course that makes sense why he did better in the 2nd trial." "You can't help anyone unless you begin by accepting their premise as valid​." Now I say this all the time — for me it was super important. Julie Daniels (or her abnormal psych professor!) sharing that "You can't help anyone unless you begin by accepting their premise as valid" was quite a moment of clarity for me, showing me how to better work not only with my dogs, but with other people too - it's easy to get stuck in our own heads thinking 'but they shouldn't be worried about that!' or whatever, and that misses the point totally! For me that little concept is a necessary thing before you can even think about consent and partnership in your training relationships. "Don't beg your dog to work. Working is a privilege.​"
Up until I found FDSA, my background was almost entirely +R in-person dog training classes. First puppy classes, then intermediate level obedience classes, and then competition obedience classes. These classes were all hour-long group classes, and the assumption was that when it was your turn, your dog was "on." Between moments of being on, your dog needed to be quiet and managed. No barking, no pulling on the leash, and definitely not a distraction. I managed to work my female Golden successfully in this environment, but found that by the middle of each class it was increasingly hard to get her attention focused when it was her turn to work. When I felt she had mastered the Beginner Novice obedience skills, I entered her in a two-day trial. The first day was amazing. The second day was a disaster. She was off sniffing instead of heeling. I attempted to get her back with me by verbally cueing. She wouldn't engage. I left the trial sad and confused. Within a day or two an advertisement for FSDA's first Bridging the Gap class came across my Facebook feed. I signed up at bronze and very quickly I saw all my errors laid out for me, and many things have shifted within my mind since then. But the biggest one was not begging your dog to work. Somewhere in that class Denise said that work was a privilege. If the dog doesn't want to work, don't beg them to work. It's their choice. This is a summary of how I interpreted it, as I don't remember exactly what was said. But it was something to the effect of getting to train/work is a privilege. It isn't something I will starve you to get you to do. And it isn't something I will force you to do. You can choose to work or not. I won't get mad if you chose not to work, but the opportunity to work will be removed, I won't try to convince you to work. Huge lightbulb moment for me. I had been begging my dogs to work for me. Not just in competition obedience training, but in life. I now realize what a privilege it is to get the opportunity for one-on-one time with guaranteed treats/play time and the opportunity to learn new things and use your brain. I also realize that if you don't beg for your dog's participation, the training is much more powerful. The dog is choosing this over all the many other things it could be doing, and it is all in. I use this mentality when out training for VST tracking with my incredible scavenging female Golden. When you train VST your ability to control the environment is pretty limited. If she decides to forgo tracking for garbage in the bushes, she's done. I will not try to get her back to the track no matter how much I wanted to finish or what my goals are for that track. She made the choice to leave the track, the opportunity to track was a privilege. No more tracking that day. No anger, we just move on, and I adjust my training plan for next time. Side note "distraction is a drive problem." That's from Lucy Newton. I also credit this mentality with much of the success I've had working with my young intact male Golden. He hasn't competed in anything yet, but he cooperates with me fully even when off leash while out in a world full of other dogs and distractions. I once spent 30 minutes waiting for him to notice me as he sat mesmerized by other dogs playing fetch. Boy did we celebrate when he remembered who I was. And I've never had to wait that long again. Have an "Aha" moment from an FDSA instructor you want to share? Feel free to leave it in the comments! !